The wreck of is locally known as the Two Anchor Wreck or Coal Barge. It has been confused with another much smaller wreck known as the W.A. Marshall. However, the wreck is much too large to be the Marshall and is most likely the James M. Hudson, a coal barge that foundered during a storm with loss of life. The wreck has been measured and found to be approximately 250 feet in length. The wreck also contains some it’s remaining cargo of coal, further supporting the Hudson identification. This wreck is upright and most of the decking has collapsed. The most notable feature of the wreck is the two anchors on the bow, hence the name. The stern section is more broken up with debris off the wreck. 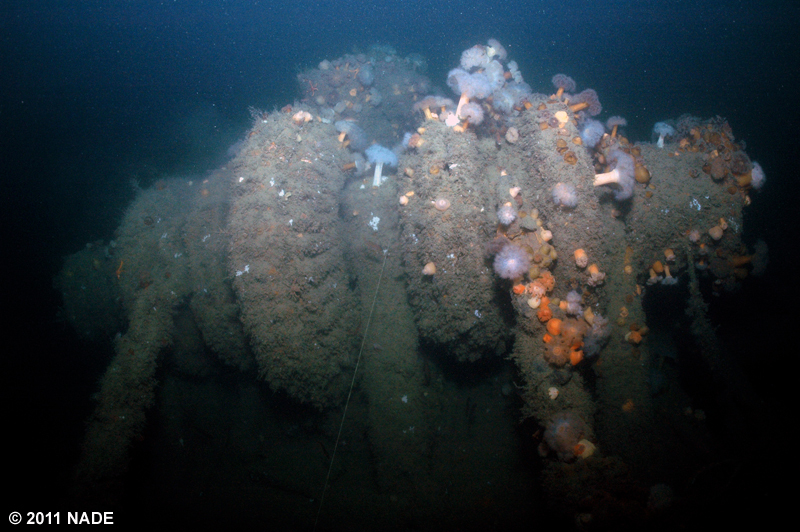 This is a nice dive and typical of the area – mono, dragger net, easy snags, semi-intact wood barge. It is rather large but still can be rounded in a dive if the visibility permits. The top of the wreck rests at about 155 feet, with max depths at high tides of approximately 180 feet.